If your business is still running Windows XP, now is the time to upgrade to a modern OS. In 2001, Windows XP was launched, and went on to become Microsoft’s most popular operating system of its time, aiding consumers and business users to be more productive and secure as high-speed Internet became ubiquitous at work and eventually in our homes. It’s no question that Windows XP was an outstanding operating system to meet the needs of customers more than a decade ago. Nearly 12 years later, technology has evolved leaps and bounds, along with the needs and expectations of those who use it. Modern businesses now have an increasing need to protect their data and ensure security, compliance and manageability. Meanwhile, modern users demand technologies that fit their personal work style and allow them to stay productive anytime, anywhere on a variety of devices. This natural evolution of technology is what is at the heart of our product lifecycle policy. 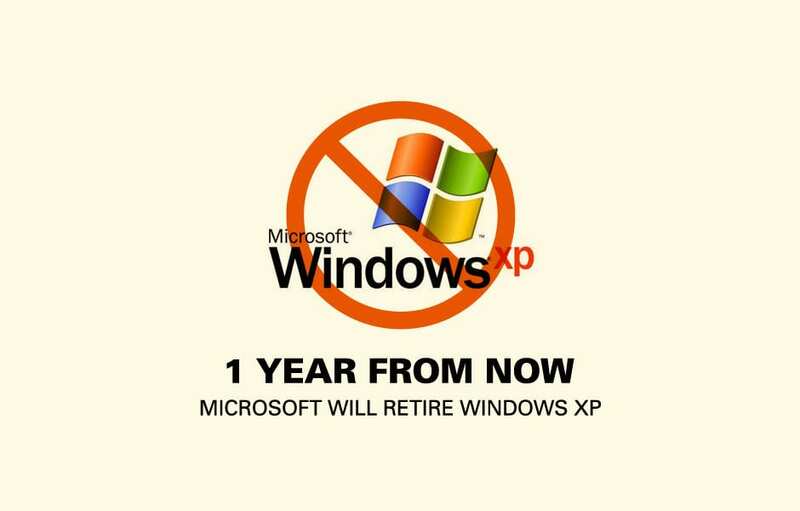 A year from now will mark the final milestone for Windows XP – that of its end of support date. Starting April 8, 2014, Microsoft will no longer provide support for Windows XP users. This means that customers and partners will no longer receive security updates to the operating system or be able to leverage tech support from Microsoft after this time. Moving away from Windows XP to a more modern platform in Windows 7 and Windows 8 will ready your IT infrastructure for future technology solutions and growth of your company. Windows 8 is the modern OS for modern businesses, building on Windows 7 fundamentals like speed, reliability and security, while creating a modern platform designed for a new generation of hardware options. With an ever-increasing lineup of devices, from notebooks, tablets, desktops, touch or type, there is now more choice than ever before with a device to fit the specific needs and unique scenarios of businesses of any size. Customers worldwide see the opportunity to take advantage of a modern operating system to support security and compliance requirements, while utilizing the latest technology from Microsoft to address the need for increased mobility. Companies from BT PLC, Emirates Airlines, Seton Hall University and Toyota Racing Developmentmoved beyond XP to Windows 7 and are deploying Windows 8 to support their unique mobile business needs, and value Windows 8 for its support for touch-based computing in particular. NOW is the time to move to a more modern Windows operating system and modernize your IT infrastructure. Businesses still running Windows XP are missing out on the tangible benefits of modernizing their IT investments from dramatically enhanced security, broad device choice to meet the needs of a mobile workforce, higher employee productivity and lower cost of ownership by future-proofing their IT investments. Recognizing that not all situations are alike, businesses may need to take different approaches to their operating system migrations due to the specific needs of their environment. For some, moving their full company to Windows 8 will be the best choice, and for others it may be migrating first to Windows 7. Still, for many, it will be deploying Windows 8 side-by-side with Windows 7 for key scenarios, such as Windows 8 tablets for mobile users. And as businesses plan to purchase new devices as part of their Windows XP migration process, they should consider user scenarios where their company will benefit from having employees use touch devices – whether it is tablets, laptops with touch capabilities, all-in-ones, or other innovative devices. This way, companies conducting hardware refresh cycles can benefit from higher productivity of its users in the immediate term, while ensuring that they are modernizing an increasingly higher proportion of their installed PCs with touch capabilities – readying their business for the future Windows platform migrations. Don’t put your business at risk. Talk to your IT Provider to start planning today. While end of support for Windows XP is still one year away, the migration process can take some time and may be costlier the longer you stayon Windows XP, ultimately putting your business at risk. The security landscape is ever-changing and new threats are coming to fruition every day, so it is critical that businesses ensure they protect their data and IP against the latest threats by deploying a modern Windows platform. Many companies of all sizes have either already made the switch off of Windows XP, or are in the process of migrating over to Windows 7 and Windows 8, enabling them to realize greater possibilities for their business using technology that simply wasn’t possible in 2001. Those that haven’t yet started their migration process need to begin as soon as possible to ensure that they meet the April 8, 2014 deadline. There are many tools, resources and best practices available, making migration easier than you may think. So what are you waiting for? Talk with your local IT Provider or call 1.866.PickITS to get started.